I also managed to review a book by Montgomery for the mini-challenge of the month. I am on my way with 1/13. Broken Promise brings me to 2 books, and meets the January challenge by being a book by Linwood Barclay. This is another book in a series so I'm 2 for 2 right now. On the board with Bowering's Burning Water - 1/13. 1/13 I'm on the board and thrilled to be back. I reviewed one book for the mini-challenge too! How wonderful! 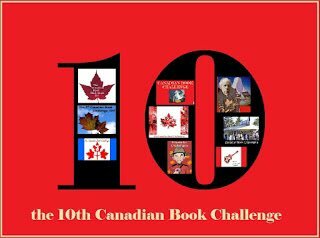 I am SO glad to be here for the 10th Annual Book Review Challenge! Now up to 2/13 - and both of them qualifying for your mini-challenge! The holiday weekend is upon us here in Canada! Have a good long weekend and let's all read another book by a Canadian author! Yay, this long weekend meant I got my 13th Canadian book read & reviewed -- met my personal challenge to try to get 13 reviews up this month :) This has been great incentive for me to get back to blogging reviews more regularly. And enjoying CanLit of course!! Congrats to everyone participating !